It’s not unusual for home buyers, especially first-timers, to get caught up in the excitement of buying their “dream home” only to wind up in a legal nightmare because they failed to have the home properly inspected before signing on the dotted line. Take for example the occupied 3,100 square foot home, built in 2003, I recently inspected. All the Transfer Disclosure Statement indicated was that a repair was completed in the master bathroom shower, and the ceiling had not been repaired, with damage evident in the kitchen directly below. The master bathroom had a separate Jacuzzi-style tub and tiled shower. I tested the Jacuzzi by filling it with water, initiating the bubbler, and operating the air flow control on each side of the tub. It appeared to operate properly. I drained the plug, tested the shower, and then the rest of the master bathroom. Everything appeared normal. After inspecting the second upstairs bathroom, I headed downstairs to test the first floor bathroom. Descending the staircase, I heard water leaking in the kitchen where, to my surprise, it was literally raining. 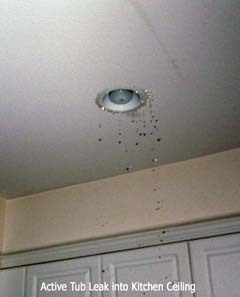 The row of canned ceilin g lights were actively dripping, water was leaking from the fire sprinkler cover, stucco-taped seams were beginning to collapse, and water was coming through the side exterior doorway framing. I anxiously phoned the property’s agents, only to leave a voice mail. I was on my own. Unable to quickly locate a mop, I started moving some of the counter top appliances and knickknacks in order to wipe down the counter tops with towels. The owner soon arrived only to find me, a stranger, moving items around her kitchen. She stood there in disbelief. I stuttered that we had a major problem. Seconds felt like minutes, and I could tell she knew more than she wanted to convey. But she finally jumped into action to find a crippled sponge mop. That and towels managed to wipe down the counter tops and direct the “ponding” water outside. As the disaster came under control, the owner confessed to the problem, with assurances that she had planned to repair it. Her admission was at odds with what was disclosed on the Transfer Disclosure Statement. I was all ears in anticipation of who was going to take responsibility. The buyer’s agent soon surfaced, needing details, and the listing agent questioned why I would even be testing the Jacuzzi tub. The following day, a general contractor opened up the ceiling in the kitchen directly below the tub. It revealed that the drain line had completely disconnected from the drain system, though it was not clear how the disconnection occurred. I was so relieved that no one had asked about my insurance. As a home inspector, I carry insurance for liability and for errors and omissions. That would cover this type of situation in which damage may have resulted from my actions. My primary responsibility as a home inspector is to methodically evaluate, inspect, and test all the major components of the dwelling. Each component of a home is thoroughly evaluated by description, condition, and functionality, and some components are evaluated in terms of their life expectancy. Sometimes recommendations are made to have the component further evaluated by a licensed contractor, who would also determine costs to cure the condition. In the case detailed above, I was able to save the buyer from tens of thousands of dollars in repairs and endless legal proceedings by simply filling and draining a Jacuzzi tub.